New shirt! 6-20-99 Just the tip!! 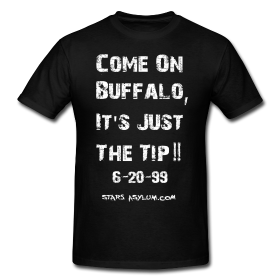 Come on, Buffalo, it’s just the tip! June 20, 1999. The date was June 20, 1999. The players were exhausted. The fans were tired from a long series, or was it simply a long night? This goal redefined rules. It broke hearts. It won the most storied championship trophy in professional sports. And if you ask anyone from Buffalo, NY, it shouldn’t have counted. June 20, 1999. 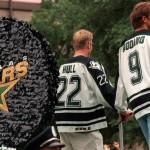 One of the best days in Dallas Stars history. This shirt may be nearly 13 years late but wear it proud to the next Buffalo game – they still hate us for it!